Step back, stretch your thinking, to create your concept priorities, such as: get our balance sheet credit-worthy within 6 months (or our primary lender will foreclose), re-establish our market place product quality image within 9 months (or our distributors will abandon ship), match our expenses with projected revenues and simultaneously create a revitalized organization within 6 months (we must have personnel reductions, but the resulting smaller organization has to improve performance), create three new products and successfully launch into the market place within 12 months (to replace dying products), establish a bona-fide market presence in China within 12 months (as our European market is collapsing). These are priorities that are created by you and your team, priorities whose achievement is necessary to make a significant step-change in your company’s performance and ongoing prospects. At this point, you may now know how to get there: in fact it’s better to not encumber your thinking with too much reality on specifics. These goals answer the question: “What must we do do, not only to survive but to also begin a positive surge, and how fast?” These goals result from brainstorming, from director input, from board or bank or creditor pressures, and from just plain common sense. Now its time for specifics. For an example, I’ll use the first, “get our balance sheet credit-worthy within 6 months”. In our case this means create cash, and although I have no idea how to do it we’ll need $25M more in 6 months than we have now. There are a finite number of ways to generate cash in relatively short order, all relating to the balance sheet. P&L items such as pricing, product cost, margins, and purchased materials will help in the long term, but not in our critical 6 month window. So we look where we can, and with insufficient data but some judgment, pick every possible area of improvement and create individual targets: Accounts receivable is area #1 [customer terms $2M, collection procedures $4M, billing timing (when do the 30 days actually start) $1M]; Capital projects #2 [reduction, even stopping projects underway, $3M]; Accounts payable #3 [supplier terms $1.5M, payment policies $1M]; Inventories [work in process $3M, obsolete (sell don’t keep) $1M, finished goods (run specials, discounts to distributors to purchase) $3M], Raw materials [run down to tight levels $1M]; get repayment on loans to distributors $1.5; sale of excess assets like patents, equipment $3M. Whew! There are lots of ways to skin a cat, and we need to use them all. Now we have one of our priorities both “in concept” and with specifics. Next week we’ll take step #3 and show how to create stack-‘em prioritization and the benefits of scrambled assignments. Albert Bandura, in Principles of Behavior Modification, stated: "One of the major obstacles to the development of effective change programs arises from the failure to specify precisely what is to be accomplished. When the aims remain ambiguous, learning experiences are haphazard." Creating objectives or priorities is hard work if you do it right; you might as well get as much benefit from the process as you can. Create a learning processvia a living-growing set of objectives: your business bible. Each month your team meets to go over progress. Some targets will be attainable, some new target opportunities may appear, some will have shortfalls. It's up to you to determine when sufficient creative juices and energies are being applied. At each month you can then amend this plan accordingly. Your knowledge of where the cash is buried is being enhanced, your awareness of the capability of your individual managers is going up, and your cash balances are growing. The key is to set these individual categorical targets, breaking it down to the smallest level of detail measureable, and have your team go at it. Most MBO processes have lots of problems. First, typically they result from a negotiation process; never a formula for crispness. Second, they are done yearly while today's business environment is much more dynamic. Third, because of their individual nature, the sum of the objectives probably doesn't reflect the driving motivations of the organization as a whole. I've stepped into situations where the individual objectives, when i reviewed them in, say, the middle of the year, made no sense: yet they were viewed by the managers as the basis for their bonuses and therefore their driving motivation. So clear the decks from these old processes, think much more crisply and effectively, and get real results. • They must be written. Robert Cialdini’s Influence Science and Practice, acknowledged by Tom Peters as “The best and best researched book…ever” on how behavior patterns are influenced, states: "Set a goal and write it down. Whatever the goal, the important thing is that you set it, so you’ve got something for which to aim—and that you write it down. There is something magical about writing things down." • They must be specific…even when your knowledge base is insufficient. There will never be enough information to ensure that your target is perfect. I'll describe how to do that next week. • They must become the key element of your learning process. That is, adjustments should occur as you move forward. The further you travel, the more feedback you’ll get, the more you'll learn. This creates an upward spiral of intelligence on how the business truly functions. Learning is imperative to the process, and is also what makes the process so powerful. • Remove distractions! This is always the first priority. Specific distractions will vary but will be easily identifiable. Just list whatever dominates operating management and board discussions that also is not a mainstream issue. • Make a step-function, permanent change in operating cash flow. • Make a step-function, permanent change in operating expense levels. • Eliminate slow-moving sku’s. For example, the bottom 30% might account for 10% of the revenue and 40% of your administrative expense and chaos. • Drive out low-margin sku’s (e.g., those below 20%) by pricing to the 50% margin. • Create design wins mentality. • Change distribution strategy, remove a layer, or replace with a more efficient system. • Reinvent the organization structure; return it to its effective level of two years ago. • Convert critical business processes to information- and rule-oriented procedures. • Retarget business development activity to concentrate on a few key markets. • Gain work-rule changes in the union contract. • Gain attention and respect from the workforce to prepare for systemic cultural changes. These short headers are only for illustration. In actual practice, make each of these priorities as clear and unambiguous and detailed as possible. Write, rewrite and test the statements with directors or managers or whomever. Next week we'll put meat on the bones of the second above; make a stpe-function, permanent change in operating cash flow. You need a specific process that targets your corporation’s top priorities in detail. The process must be easy, it must generate intelligence and improvements through constant review, and the execution must challenge the organization. During my career as a turnaround CEO, I’ve developed a fourth generation of MBOs that meets all these criteria. The process is described in the publications over the next three weeks. Rigorously followed, this fourth-generation procedure will have your company spearing the target every time. We’ve been through (a) concept-type priorities, (b) specifics, (c) tough-minded initial stack-‘em prioritization, and (d) scrambled assignments: To conclude this topic today I’ll address (e) mid-course learning-based corrections, and (f) event or decision driven reprioritization. (e) By launching priorities with very specific goals, making the list of specific possibilities extensive, and continuously challenging the team via review of those specifics, you will create many mid-course learning-based corrections. I previously laid out the specifics for the “get our balance sheet credit-worthy within 6 months” priority. Remember we created this conceptual priority, and then laced it with specifics; specifics created partially by judgment and partially by intuition. So now we’ve been underway for a while, and the team assigned to this priority creates an interim report: “we’ve discovered that we have been billing 5 days after shipping so are losing 5 days on our collections; by billing on the day of shipment we should save $3M not the $1M we estimated”, “collection procedures, originally targeted at $4M, is not achievable, customers are only 2 days late on average so practically no savings are available”, “customer terms are longer than competition by 10 days and gives us no competitive advantage; by correcting to market we can achieve $5M vs. the $2M projected”, “in addition, via this exploration, we found a new opportunity--payments are mostly coming in by mail vs. electronically so by educating and facilitating we can save 2 days, $1.5M” . The result is that the new target for the A/R portion of this objective is now $9.5M vs. the original $7M target. It goes on and on. 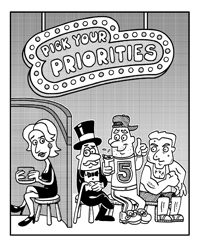 (f) When you face real-time decisions, your initial prioritization gets put to the stress test. Two of our initial priorities were #1 cash creation, and #3 re-establishing our market place product quality image. We know that all four of our priorities were considered mandatory, but we initially determined that #1 cash creation just had to be ranked higher than #3 product quality image because, without meeting bank covenants on cash, the company will be out of business. So, because of that, initially an investment to re-tool several products and to market those improvements was put on hold. However today we’re now assessing new inputs. First, the cash collection actual results have been above target, and those targets have been increased; second our largest customer has made warning threats to remove us from their suppliers list if there was not a quality improvement program in place. Time for a reassessment based on new realities! We now decide that #3 product quality is ahead of #1 cash creation and that specific decision is therefore made; and as a result the priorities will be--da da--reprioritized. By following steps (a) through (f) your organization is highly engaged in gaining breakthrough results, and you and they are learning rapidly concerning the inner workings of your business and those entrusted to gain further results. The guidelines for “Pick Your Priorities” and for creating a “Living, Growing, Breathing Business Bible” follow. So here’s where the fun and the real learning starts. 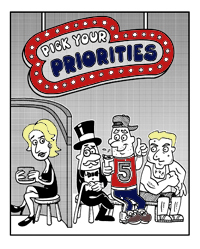 Your team must force rank these four priorities. Stack ranking is an old idea applied to various lists, such as personnel, and is usually a rather lazy process. In this case, if done in a lazy, idle way, it will be easy and useless: "oh it’s 1,3,2,4 in that order". But don’t be lazy, get into real specifics and tough tradeoffs. You may have a half-day debate on the merits of gaining cash by reducing inventories vs. gaining a market presence in China via placing inventories on location. Force ranking done correctly is tough, hard work; especially if you conclude that your company cannot survive without all these priorities being implemented successfully. But the result will be astounding, measured in learning about your business’s dynamics, learning about the abilities of individual mangers to find solutions, gaining creation of new ideas, thinking through tradeoffs, and making big jumps in the very specific clarity of your overall direction. These outcome products make your organization smarter, faster, and more together in its direction. (d) Scrambled assignments is another breakthrough. 99.9% of CEO’s would select the person on their staff most closely aligned with a given priority to be one in charge of it: #1, cash creation, would always go to the CFO. Change the paradigm. Learn many things simultaneously. Put the Operations managers in charge: what does that accomplish? How well can the manufacturing manager run a project when he doesn’t have direct authority (will need inputs and insights from all disciplines)? What insights might result from a completely different perspective? How well do other functional managers (like the CFO) deal with reporting (on this priority) to someone else? What constructive tradeoffs might be engineered? Teamwork gets enhanced when everyone participates in bonuses for achievements on all priorities combined. Everyone knows about management by objectives, it’s old hat. The original methods for implementing are way out of date, and generally counter-productive and time-wasting as performance time frames have significantly shrunk and everyone knows how to game that system. This approach is on the cutting edge of performance incentivization. Topics: Fourth-generation Management by Objectives; Clear the Deck; Beyond the To-do List; Relentlessly Pursue Priorities; The CEO’s Guide to 4th Generation MBO’s. To be published 2Q07.